This post is intended to help you think about, and work with, those mysterious amplitudes. More in particular, I’ll explore how potential differences change amplitudes. But let’s first recapitulate the basics. As it’s usually instructive to do a quick dimensional analysis, let’s do one here too. Energy is expressed in joule, and dividing it by the quantum of action, which is expressed in joule·seconds (J·s) gives us the dimension of an (angular) frequency indeed, which, in turns, yields a pure number. Likewise, linear momentum can be expressed in newton·seconds which, when divided by joule·seconds (J·s), yields a quantity expressed per meter. Hence, the dimension of p/ħ is m–1, which again yields a pure number when multiplied with the dimension of the coordinates x, y or z. In the mentioned post, I also gave an unambiguous answer to the question as to what energy concept should be used in the equation: it is the total energy of the particle we are trying to describe, so that includes its kinetic energy, its rest mass energy and, finally, its potential energy in whatever force field it may find itself, such as a gravitational and/or electromagnetic force field. Now, while we know that, when talking potential energy, we have some liberty in choosing the zero point of our energy scale, this issue is easily overcome by noting that we are always talking about the amplitude to go from one state to another, or to go from one point in spacetime to another. Hence, what matters is the potential difference, really. The energy ‘over and above’ the rest energy, which includes both the kinetic energy, i.e. m∙v2/2 = p2/(2m), as well as the ‘binding and/or excitation energy’, which he refers to as ‘internal energy’. Finally, there is the potential energy, which we’ll denote by U. However, we will follow Feynman in his description, who uses the non-relativistic formula Ep = Eint + p2/(2m) + U. This is quite OK if we assume that the classical velocity of our particle does not approach the speed of light, so that covers a rather large number of real-life situations. Also, to make the example more real, we will assume the potential energy is electrostatic, and given by the formula U = q·Φ, with Φ the electrostatic potential (so just think of a number expressed in volt). Of course, q·Φ will be negative if the signs of q (i.e. the electric charge of our particle) and Φ are opposite, and positive if both have the same sign, as opposites attract and like repel when it comes to electric charge. The illustration below visualizes the situation for Φ2 < Φ1. For example, we may assume Φ1 is zero, that Φ2 is negative, and that our particle is positively charged, so U2 = qΦ2 < 0. So it’s all rather simple really: we have two areas with a potential equal to U1 = qΦ1 and U2 = qΦ2 < 0 respectively. Hence, we need to use E1 = Eint + p12/(2m) + U1 to substitute ω1 for E1/ħ in the first area, and then E2 = Eint + p22/(2m) + U2 to substitute ω2 for E2/ħ in the second area, which U2 – U1 < 0. To sum it all up, the classical statement energy conservation principle is equivalent to the quantum-mechanical statement that the temporal frequency f or ω, i.e. the time-rate of change of the phase of the wavefunction, does not change – as long as the conditions do not change with time, of course – but that the spatial frequency, i.e. the wave number k or the wavelength λ – changes as the potential energy and/or kinetic energy change. and, importantly, try to analyze what happens if U2 – U1 is larger than p12/(2m), so we get a negative value for p22. Just imagine that Φ1 is zero again, and that our particle is positively charged, but that Φ2 is also positive (instead of negative, as in the example above), so our particle is being repelled. In practical terms, it means that our particle just doesn’t have enough energy to “climb the potential hill”. Quantum-mechanically, however, the amplitude is still given by that equation above, and we have a purely imaginary number for p2, as the square root of a negative number is a purely imaginary number, just like √−4 = 2i. So let’s denote p2 as i·p’ and let’s analyze what happens by breaking our a·eiθ2 function up in two separate parts by writing: a·e−iθ2 = a·e−i[(E2/ħ)∙t − (i·p’/ħ)x] = a·e−i(E2/ħ)∙t·ei2·p’·x/ħ = a·e−i(E2/ħ)∙t·e−p’·x/ħ. 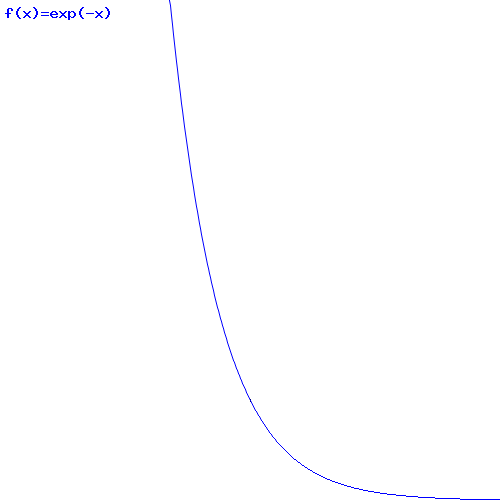 Now, the e−p’·x/ħ factor in our formula for a·e−iθ2 is a real-valued exponential function, and it’s a decreasing function, with the same shape as the general e−x function, which I depict below. This e−p’·x/ħ basically ‘kills’ our wavefunction as we move in the positive x-direction, past the potential barrier, which is what is illustrated below. However, the story doesn’t finish here. We may imagine that the region with the prohibitive potential is rather small—like a few wavelengths only—and that, past that region, we’ve got another region where p22 = 2m·[p12/(2m) − (U2 – U1)] is not negative. That’s the situation that’s depicted below, which also shows what might happen: the amplitude decays exponentially, but does not reach zero and, hence, there is a possibility that a particle might make it through the barrier, and that it will be found on the other side, with a real-valued and positive momentum and, hence, with a regular wavefunction. Now, that should be it for today, but let me end this post with something I should have told you a while ago, but then I didn’t, because I thought it would distract you from the essentials. If you’ve read my previous post carefully, you’ll note that I wrote the wavefunction as Ψ(θ) = a·eiθ, rather as a·e−iθ, with the minus sign in front of the complex exponent. So why is that? There is a long and a short answer to that. I’ll give the short answer. You’ll remember that the phase of our wavefunction is like the hand of a stopwatch. Now we could imagine a stopwatch going counter-clockwise, and we could actually make one. Now, there is no arbitrariness here: it’s one way or the other, depending on our other conventions, and the phase of our complex-valued wavefunction does actually turn clockwise if we write things the way we’re writing them, rather than anti-clockwise. That’s a direction that’s actually not as per the usual mathematical convention: an angle in the unit circle is usually measured counter-clockwise. If you’d want it that way, we can fix easily by reversing the signs inside of the bracket, so we could write θ = k·x − ω·t, which is actually what you’ll often see. But so there’s only way to get it right: there’s a direction to it, and if we use the θ = ω·t − k·x, then we need the minus sign in the Ψ(θ) = a·e−iθ equation. It’s just one of those things that is easy to state, but actually gives us a lot of food for thought. Hence, I’ll probably come back to this one day. As for now, however, I think you’ve had enough. Or I’ve had enough, at least. 🙂 I hope this was not too difficult, and that you enjoyed it.